The following article was written by Mistress Eleanor Catlyng, New Scribes Deputy, as part of the Gazette’s ongoing series of informational articles about the East Kingdom. Held high in court, the gold leaf glinting, the beautiful portrait evoking the recipient, the elaborate calligraphy catching your eye – an East Kingdom scroll creates a moment. 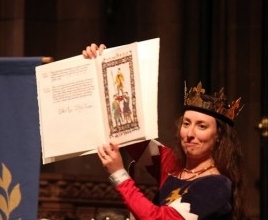 Whether an Award of Arms or a Peerage scroll, each one is unique – designed especially for the recipient – and carefully created by the scribes of the Kingdom. Unlike the other regalia, medallions, and tokens of some awards, a scroll begins its life at the hands of the Tyger Clerk of the Signet (or Signet, for short). Before that, conception originates with the Royalty. Taking the words of Their people, the consultation of Their Orders, and Their own knowledge of the good works of Their people, Their Majesties choose to give an award. Behind the scenes, the Royalty’s Scheduler (person designated to schedule awards) discreetly works on scheduling the award – contacting those who recommended, a person’s Peer, or a loved one to find out what Royal Progresses they are likely to attend. A date determined, the Scheduler then relays the news to the Signet. Our Signet coordinates all the scribes. She (or he) knows who is active, who prefers what types of work, what experience they have, what media they work in, what other scribes they like to work with, their typically needed lead time, and all the details necessary to assign the scroll to a person or people who will lovingly create this work of art. The Signet searches the rolls of active scribes to find one who is both available and, when possible, has a personal connection to the recipient (someone who is local to them, a member of their household, or someone who shares a common interest). At this point, the Signet, in strict confidence, contacts the available scribe they feel is best suited to the assignment. Once a scribe agrees to midwife the assignment, they use the information provided (usually the recipient’s full name, details of the recommendation(s) their Majesties received about the person, and their registered arms) to design a scroll. Many scribes will try to include some personal aspect in the design – an element of the recipient’s heraldry, a small portrait or illuminated items that match their interests, wording that is unique to the person’s deeds, or details that are specific to their period and persona. For armigerous awards, registered arms will also be both illuminated and calligraphed on the scroll. The scroll then comes to life within their hands. Most commonly, these labors unfold over the weeks preceding the event, but sometimes late tidings diminish the gestation to days. Finally, the scribe or a trusted courier delivers the scroll to Their Majesties or Their Herald, and the moment arrives at Court. The recipient is called, the Herald reads the words, and the scroll is held aloft to greet the Known World. A cascade of “oohs” and “ahs” precedes the final celebration, an uproarious “Vivant”. This is so cool! How can I become a scribe? Most importantly, no experience is necessary! We are happy to work with people with no art experience as well as with people who have other art training. You can work on the whole scroll, or just the components that are most interesting to you (calligraphy, illumination, wording). If you focus on only one component, we can match you up with others to complete full scrolls. Those who may wish to work in alternate media (glass, wood, stone, embroidery, etc.) are also encouraged to contact us. Contact the Signet (signet@eastkingdom.org) or her New Scribes Deputy (newscribes@eastkingdom.org) and let them know. We’ll introduce you to other scribes who are local to you, point you at local scribal workshops or nearby events with scribal classes, and try to coach you via email as best possible. You can also look to a scribe you know to mentor you into the process. As you practice, we’ll ask you send us a sample of your work. As your skills and confidence evolve, the Signet’s office can assign you backlogs (awards given without a scroll) which have long lead times (12 or more weeks) and “live” award assignments for upcoming courts when you are able to handle a shorter lead time (usually 2-12 weeks at most). New scribes can also work on “blanks” (scrolls that are just illuminated, to be calligraphed at a later date) with no deadline. Blanks are often used when last minute assignments don’t allow for the completion of a full scroll, but an experienced calligrapher can quickly complete the work on something already illuminated. Some Baronies and other groups give award scrolls with their local awards or tournaments, which are typically arranged directly with the Baron/Baroness or other local head, and scribes both within those areas and outside are welcome to offer their services in this way. If you are not interested in completing assignments for the Kingdom, we are still happy to foster your learning in the scribal arts, but forgive us if we do ask you from time to time! Extensive information, including the East Kingdom Scribes Handbook, is available on our website where you can explore and find resources including our interest questionnaire, which goes directly to the Signet. Contact the Signet and let her know your interest. If the scroll is not already assigned, she will ask you for some detail of your prior experience (and possibly images if she is unfamiliar with your work), to help determine how best for you to be involved in the project. If the scroll is already assigned, she will try see if there is a way you can support the already assigned scribe. Please do not be offended if she has to say no. Some scribes prefer to work alone, or the time frame may not allow for collaboration. You are always welcome to give a friend a personal token after Court so that they know of your support and love. Contact the Signet as soon as possible, and let her know. Again, if the assignment is already given and the other scribe has begun, this may not be possible, but sometimes she can reassign or arrange for you to work with the other scribe. If it doesn’t work out this time, she’ll keep your request on file in case the person receives another award which can be assigned to you. If the award is on the backlog, please contact the Backlog Deputy (backlogs@eastkingdom.org) about the assignment. Contact the Signet, and let her know, even if the someone is the Royalty or a member of Their Household. If the assignment is not already given, she can usually just officially confirm the assignment is yours. If the assignment has been given to another scribe, she’ll see if it can be reassigned to you or if you can work with the other scribe. If that isn’t possible, she’ll keep you in mind for future assignments. If the scroll is a backlog, contact the Backlog Deputy. Contact the Backlog Deputy. Chances are, if it’s relatively recent, he (or she) already knows and is working to assign it. He can confirm if your scroll is on the list or not, and add it if not. Once you are on the list, hopefully, you can expect to get this scroll within a year. If it’s been more than a year, it’s ok to contact him again, as it may have gotten mislaid somewhere along the way. No statute of limitations applies, even if it the award is decades old. You may make arrangements privately with a scribe, but please inform the Backlog Deputy of the details so that they can make note and track it until it is complete. Contact the Backlog Deputy. He’ll add it to our list of backlog scrolls to assign it. The age of the scroll doesn’t matter, and we always have newer scribes or other scribes who appreciate the relaxed completion schedule. You may also make private arrangements for this, but please keep the Backlog Deputy apprised so that the scribe gets credit for their work. You are welcome to engage any scribe to fill these in once they are registered. If you don’t know any scribes available to do this, please feel free to contact the Signet, and she can find you someone to work on it. Occasionally we have a drop-in table at events where you can bring your scroll to do this; watch event details for information. Contacting the Signet is not necessary in either of these cases, unless you want to acknowledge someone’s good work for her records. While we do give preference to local scribes, we welcome your interest and will consider you for assignments as well. Donation of scroll blanks is also welcome from any scribe regardless of residence. Please contact the Signet to let her know of your interest.